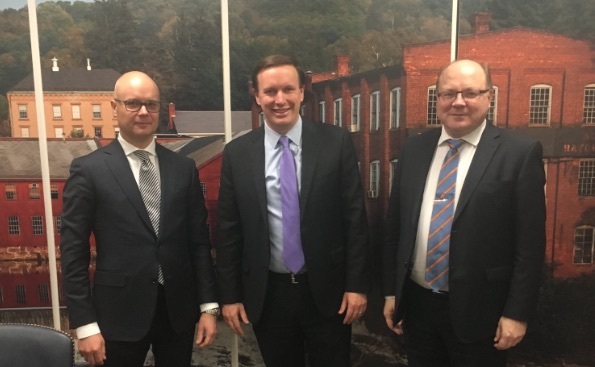 As part of Hybrid CoE’s outreach activities, Chairman of the Steering Board Jori Arvonen and Director Matti Saarelainen visited North American capitals in order to meet parliamentary leaders and government officials, as well as to reach out more broadly to experts on countering hybrid threats. The United States is a participating country of Hybrid CoE, and Canada is an eligible country to join in. On 17 November in Washington D.C., Director Matti Saarelainen gave a public speech at an event in the Elliot School of International Affairs of the George Washington University. The event was organised in partnership with the Embassy of Finland and EU/NATO institutions. In this context, Mr Saarelainen introduced the Centre of Excellence as a hub of expertise for countering hybrid threats. He addressed the need to detect hybrid incidents already in a priming phase and to respond with active measures to hybrid activities in an operational phase. This public event on common responses to shared hybrid threats was also addressed by Mr Ludwig Blaurock from the EU delegation to the USA. On 20 November in Ottawa, the Chairman of Hybrid CoE’s Steering Board Jori Arvonen addressed the 4th Annual EU-Canada Common Security and Defence Policy Symposium. The CSDP Symposium tackled such security issues as asymmetric and hybrid warfare. At a time when the lines between external and internal security are becoming increasingly blurred, Canada and the EU share the same strategic objectives, said Peteris Ustubs, the EU Ambassador to Canada. 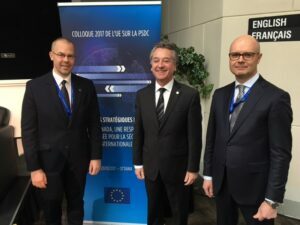 At CSDP2017 Symposium, EU Ambassador Peteris Ustubs and Parliamentary Secretary (to Canada’s Defense Minister) Jean Rioux discussed Euro-Atlantic cooperation in countering hybrid threats with Jori Arvonen. In this context, Mr Arvonen introduced the Centre of Excellence as a platform for transatlantic cooperation in countering hybrid threats. According to Mr Arvonen, EU-NATO cooperation is to be considered as the strategic context for the Centre of Excellence, the whole of society approach as its strategic content to build our resilience and the network model as its strategic methodology allowing us to share best practises and lessons learned. The panel on new hybrid challenges was also addressed by Assistant Professor Stephanie Carvin (Carleton University, Canada), Director General Gregory Smolynec (Department of National Defence, Canada) and Director Gabor Iklody (Crisis Management and Planning Directorate, EEAS).